Forget everything you’ve ever disliked about store-bought applesauce. 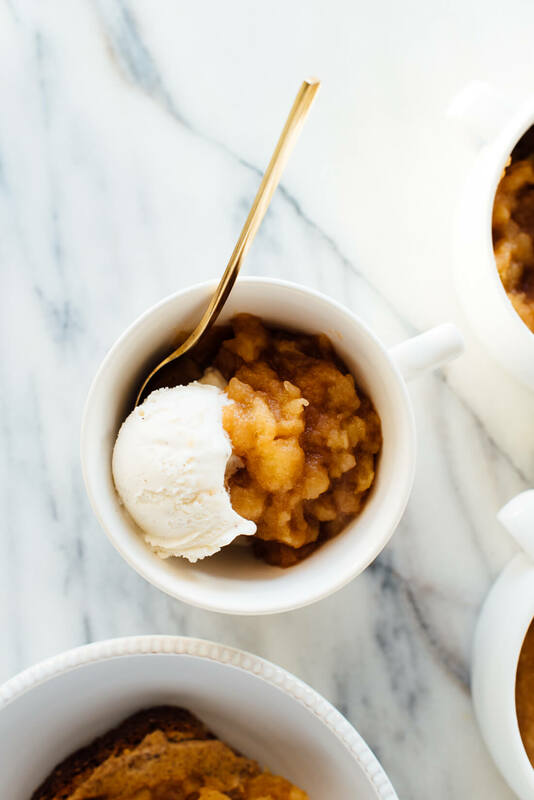 This homemade applesauce recipe tastes like the inside of an apple pie! Applesauce is very easy to make and requires just a few basic ingredients. In its most basic form, you’ll need apples, water and sweetener. I add cinnamon for some autumnal spice, but you could leave it out and/or add other warming spices like ginger, nutmeg, or clove. Then, add a tiny splash of apple cider vinegar or lemon juice to liven it up. Ta da! 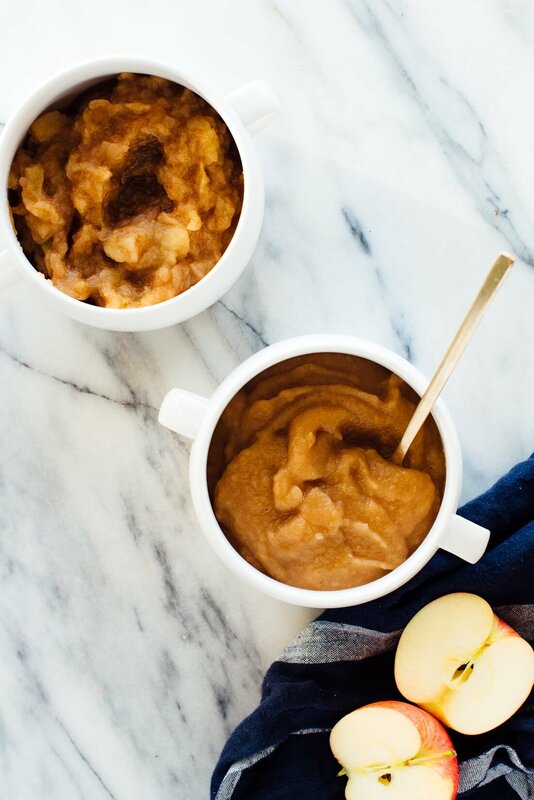 Meet the best applesauce you’ve ever had. I use maple syrup (or honey) instead of plain sugar to naturally sweeten my applesauce. Bonus? With liquid sweetener, you can easily add more to taste at the end, so you won’t risk ending up with too-sweet applesauce. If you’re a fan of tart applesauce or if you’re using particularly sweet apples, you can leave out the sweetener altogether for no-sugar-added applesauce. Homemade applesauce is a healthy and delicious snack on its own. What else can you do with applesauce? Serve it on ice cream like it’s an apple crisp. Pile homemade applesauce onto toast with almond or peanut butter. Swirl it into your oatmeal. Layer applesauce between yogurt and granola for an apple parfait and people go wild. The apple crisp parfaits in my cookbook were a favorite with my recipe testers. 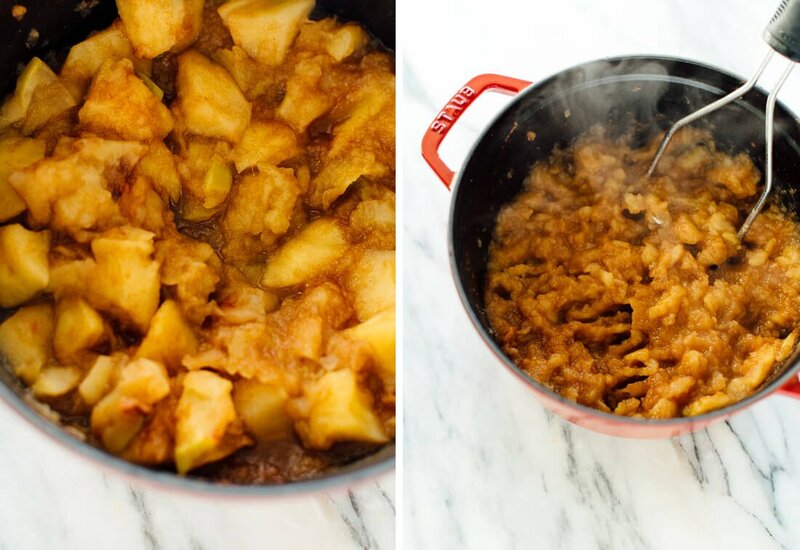 Chunky or Smooth Applesauce, you pick! 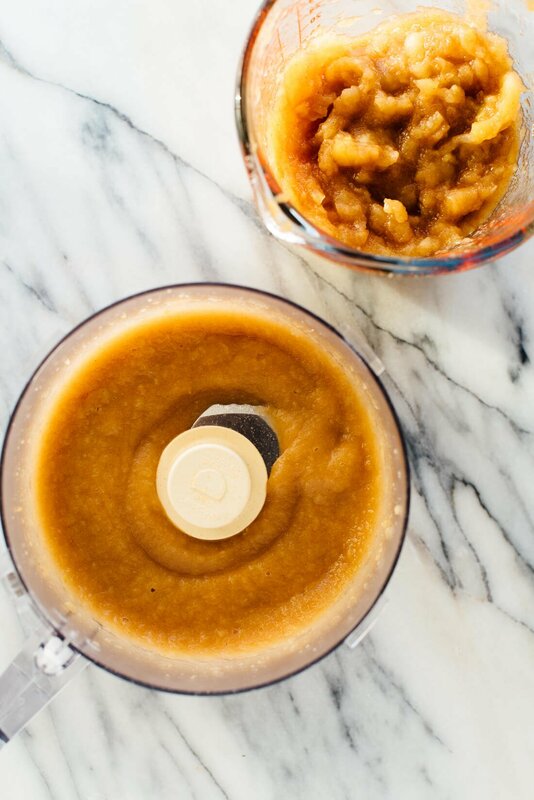 I love the texture of chunky homemade applesauce, but you can blend it smooth if you prefer. Since this applesauce is thick, you’ll have better luck with your food processor than an immersion blender. Bottom line, this applesauce is a fun and easy recipe to make. It’s apple season, so let’s get to it! Please let me know how it turns out for you in the comments. Your feedback is so important to me. Extra apples? 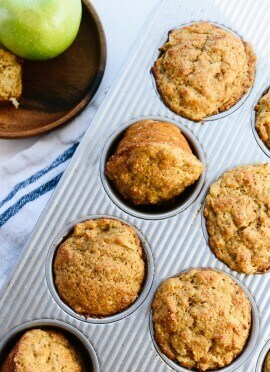 Check out my apple steel-cut oatmeal, apple muffins, gluten-free apple crisp, and favorite green salad. Learn how to make delicious homemade applesauce! 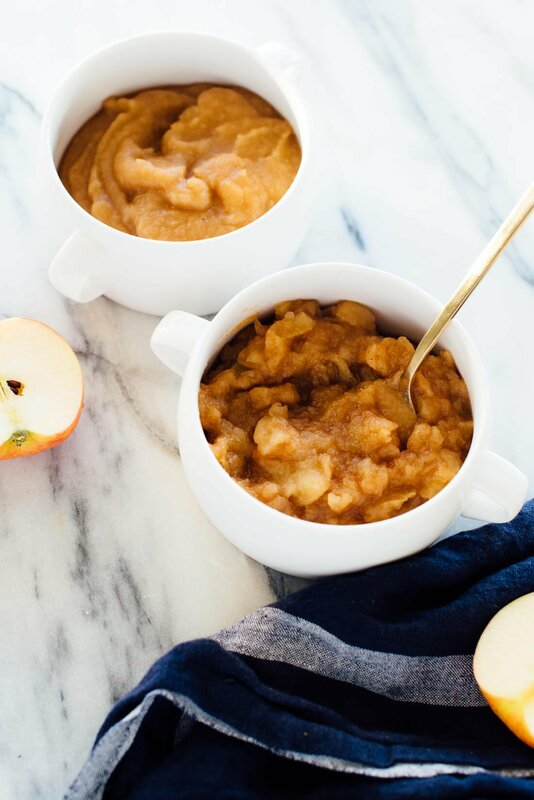 This easy applesauce recipe can be chunky or smooth. It’s also naturally sweetened with maple syrup or honey, to taste. Recipe yields about 4 cups. 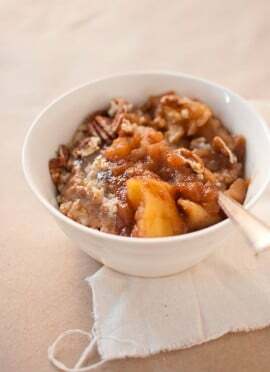 Serve warm or chilled; let it cool to room temperature before covering leftover applesauce and storing it in the fridge. Leftover applesauce will keep well in the refrigerator for about 1 week, or for months in the freezer. Recipe adapted from the applesauce in my cookbook’s apple crisp breakfast parfaits and my maple cinnamon applesauce. Make it vegan: Use maple syrup, not honey. Make it sugar free: Just omit the maple syrup for unsweetened applesauce. Canning applesauce: From what I’ve read, applesauce is inherently safe to can in a water bath due to apple’s high acidity and sugar content. That said, this recipe has not been validated for safety. Here’s a canned applesauce recipe and applesauce FAQ’s from my friend Marisa. It’s so easy, and so much better, and gives you control over the sugar that I don’t understand why shop bought exists at all. With you all the way on this, so versatile too. I am happy you think so, Deborah! I like being able to sweeten to each liking. Enjoy! Kate, I like to cook my apples with skins on and cores in. Then I put them through a chinois to stran out apple skins and cores and seeds. You really get a stronger apple flavor. Sounds like a great recipe. Have you ever tried a food mill? You don’t have to peel or core the apples, just cut them in quarters. Cook the apples with a small amount of water (only enough water so they don’t burn) until they are mushy. Put them through the mill in small batches. I like to do it after they have cooled a little, but still are warm. Scrape the bottom of the mill periodically with a spatula . Add spices when you are finished. I use cinnamon and nutmeg to taste. I find that apples are so sweet they require no sweetener of any kind. Thanks, Christine! No, I don’t have a food mill. If I get one someday, I will try that! I’ve been making my own applesauce this fall. It makes such a perfect addition to my lunch each day! YESSS! I love this—it’s SO fall! In the last year, I’ve really gone back to “basics” and try to eliminate as many processed foods from our pantry as possible! I just was just looking for a comforting sweet recipe and then you posted this! I tried this recipe this afternoon only with half pear/half apple because I didn’t have enough. It is so surprising how simple and inexpensive it is to create so many recipes like this! I love a lot of your recipes and ideas. This applesauce is great for when you want the apple pie flavor, but I have a suggestion for you to try. My mother always made applesauce that tasted like the best of the crisp apples fresh from the tree. We mixed varieties for best flavor. Golden delicious, Fuji make a great combo. Any sweet, crisp, tart apple works well. 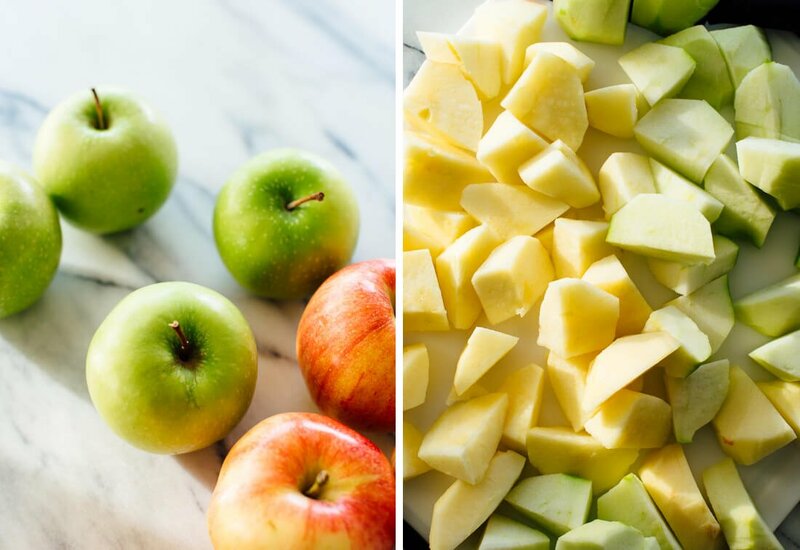 We cook down sliced apples leaving it slightly chunky–adding just enough sugar for flavor and preservation needs. Then just enough lemon juice to keep the color bright. We can it in pints or quarts. My nieces and nephews beg for it all the time! Thanks for your comment, Suzanne! Homemade applesauce allows for variety that is for sure! This was delicious – thank you so much! I had a bunch of leftover apples after going apple picking last week, and this was a perfect solution. So easy, and so tasty. I did 2 tsp of cinnamon and 1 tsp of ginger, since I love warming autumnal flavours, and the extra tsp of ACV. Delicious! Sounds delicious, Sam! I am a fan of those spices myself. Thanks for sharing and for your review! So tasty and simple… Your recipe is very similar to mine, except that I do not add cider vinegar / lemon juice. Does it allow you to keep it longer? this is perfect timing! i have a bunch of apples picked from my parents’ orchard and i was wondering about making applesauce with them. i love how your recipes are so delicious but inviting & approachable. thanks for sharing! Sounds Good! What a Lovely Recipe. I love apple but can’t have any experience to eat applesauce. I think it’s different from other Recipe. I need to try at my kitchen! Thanks, Rakib for your review! This recipe is so simple and delicious, I just made this and your favorite granola and I can’t wait for my breakfast tomorrow morning! I like how you can adjust to recipe to your own liking. And it smells divine! Two great recipes! Thanks for your comment, Ana. I really appreciate the review. Hope your breakfast was fantastic! I make applesauce every year with crabapples from my tree. It’s delicious. We prefer it silky smooth so I use my blender. Next time I’m going to add Apple cider vinegar- never seen that suggested before so I’m curious to see how it tastes. For a twist I sometimes add fresh ginger which is good too. Sherry, your applesauce sounds incredible! Do try adding a tiny splash of apple cider vinegar next time; I think you’ll like it! I am glad it tasted great! The watery could be due to the type of apple used and the extra moisture that can be found in the skin. A great and welcome addition to oatmeal for sure! 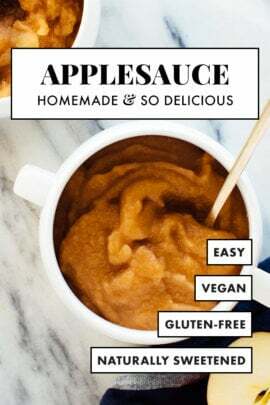 I just made this applesauce this morning, a Saturday morning, and it smelled so good I immediately invited friends over and we made pancakes to go with it! I’ve never made homemade applesauce before and now I’m smacking my head wondering why – such a delicious, easy recipe and it tastes like a treat without adding too much sugar (I just drizzled some honey in without measuring, maybe a tablespoon, and it was perfect). I used my immersion blender to blend it up a bit and left some chunks in there, and I loved the texture. 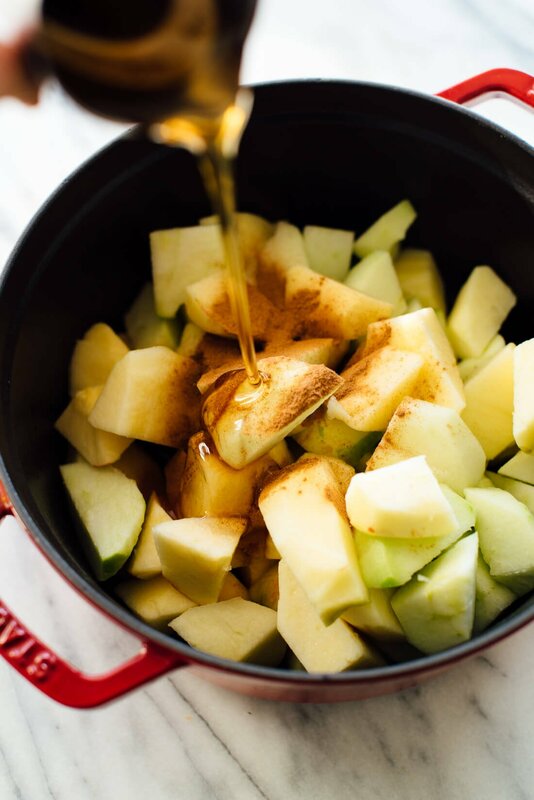 I can’t wait for summer when Michigan honeycrisp apples go on sale so I can make a whole batch of those into applesauce – they’re my favorite kind! P.S. In your recipe, you say to “cover and bring the mixture to a simmer,” but then don’t say when to take the lid off. I know to take it off after a while so the liquid will reduce and you’ll get thick applesauce, but other people might not – that might be the culprit behind any watery applesauce questions. Thanks for sharing, Mary! As for your question, after it has simmered for roughly 15 minutes (see end of step one) you are to remove pot from heat (step 2) and use the method you would like for your desired consistency. Hope this helps! 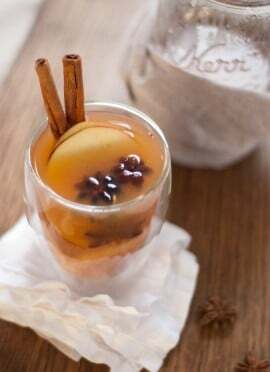 Thanks for sharing this delicious recipe and i will try to make this at my Home! I’ve been looking for a good applesauce recipe – thanks – I am sure my kids will love t his so much!! I hope they love it too! Let me know what you think, Bec. Kate I made your applesauce w/honey & cider vinegar & it was SO DELICIOUS I ended up making it again a week later as I had bragged about it so much & gave small jars of it to many neighbors who also loved it as it does taste like apple pie filling. I also cooked the apple slices In my microwave for 10 minutes as I tripled the recipe, but did not triple the cinnamon, maybe 2-1/2 times & also added nutmeg. I prefer chunky, so mashed it. I have made applesauce for many years, but this recipe is by far the ABSOLUTE BEST! So am sticking to it with now & then small additions just for variety.Thank you for sharing this awesome recipe! You’re welcome, Marge! I’m glad you like it so much. Thanks so much for your review. Could I double the recipe following the same measurements and cook times? If you double, of course double all ingredients equally. Since you will have a larger volume, the cook time will likely be longer. Use the base recipe as a guide and then slowly increase from there. Let me know what you think, Jenny! This is a great applesauce recipe! I make it to add to my Overnight oats all the time now. I mix it up occasionally by changing the amount of apple cider vinegar and changing the honey out for ginger. Oh ginger would be interesting. Thanks for sharing, Madison!